Many National Basketball Association teams are now looking towards Europe to find the next big player that can average a double-double every season. One player who fits into that mold is Polish basketball player Marcin Gortat who even though he only managed to achieve that feat in one season in his so far 11-year NBA career, he has always been trusted to deliver the goods whenever he stepped onto the court. Marcin Gortat was born on the 17th of February, 1984 in Lodz, Poland where he was raised by his athlete parents; Janusz and Alicja Gortat. With the influence of his parents, Gortat, as a child, participated heavily in sports; specifically soccer and track and field. He later transitioned to playing basketball and decided to focus on the game which was more popular and lucrative on the other side of the Atlantic Ocean. After completing his education at a technical college, Gortat joined his hometown basketball team LKS Lodz where his performances caught the interest of German professional basketball outfit, RheinEnergie Cologne in 2003. After two years with his new team, Marcin Gortat was drafted by the Phoenix Suns in the second round of the 2005 NBA with the 57th pick. The player, however, opted to remain in Germany for one more year to continue his development. The following season, his team won the German domestic championship and for the first time in its history, they played EuroLeague basketball in the 2006-07 season. In August 2007, Gortat moved to the NBA and joined the Orlando Magic who had acquired his rights in a trade from the team that drafted him. Gortat spent some time with Anaheim Arsenal in the NBA Development League before he was able to make his debut on March 1, 2008, playing in just 6 games that season, averaging 3.0 points and 2.7 rebounds per game. The player did not enjoy a lot of playing time because he was being used as a back up to Dwight Howard, however, he got the chance to brag about being the only Polish player to have played in the NBA Finals when the team got there in 2009. In December 2010, Marcin Gortat was traded back to the Phoenix Suns who he enjoyed very good playing time with. Having previously averaged about 12 mins per game, Gortat found himself to be an integral part of the Suns’ team as he was now playing an average of about 30 mins per game. His time with the Suns, however, lasted for three seasons before he was traded to the Washington Wizards. From 2013 to 2018, Gortat, who had now earned the nickname “The Polish Hammer”, was averaging very close to a double-double although he outrightly managed the feat in 2016-17. Marcin Gortat’s last contract was a five-year deal worth $60 million agreed upon in July 2014, which means he takes home an average of $12 million every year. The 11 year NBA veteran’s earnings were not as high when he first joined the association in 2007. His first contract was a two-year $1.13 million deal with Orlando. In 2009, after agreeing a five-year $34 million deal with the Dallas Mavericks, the offer was matched and he had to remain with the Magic because he was a restricted free agent. That deal ran to 2014 when he then put pen to paper on his current contract. As mentioned above, Marcin Gortat comes from a family of athletes. His father is a Polish two-time Olympic bronze medal-winning boxer in the light heavyweight division (– 75 kg) from the 1972 and 1976 Summer games while his mother also represented Poland as a part of the volleyball national team. Marcin’s older brother, Robert, is equally an athlete and he followed in their father’s footsteps to become a boxer. 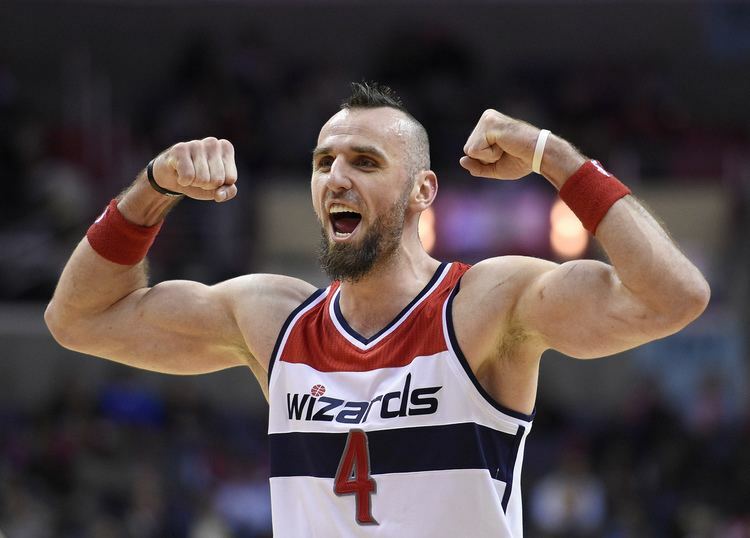 Details about Marcin Gortat’s love life are conflicting as a few publications say that he is dating and could even be married, while others say that he is very much single at the moment. The woman who was said to be in the basketball player’s life is popular Polish model Anna Kociuga, also referred to as Anya Gortat. Gortat reportedly met the 5 feet 10 inches tall, 125 pounds heavy model whose body measurements are 25-34-36 inches, in 2009. They were said to have moved in together but due to their conflicting work schedules, were unable to spend meaningful time together and build on their relationship. Gortat and Kociuga eventually decided to call quits on their relationship and it’s not clear if the two have kept in touch or are willing to work it out in the future. The Clippers center has made it known he will be looking to start a family in the near future, also adding that he is not sure if he will continue playing past his current contract which ends in July 2019.